Marcel Duchamp, one of the most important artists of the 20th century, stunned the art world in 1917 by displaying an upended urinal as a sculpture. This was considered a landmark event, which began the movement of using an ordinary object and elevating it to a work of art. Damien Hirst, born in 1965, is Britain’s richest living artist. He is famous for his works of art in which dead animals are preserved in formaldehyde. The above pictured dead shark suspended in formaldehyde sold in 1991 for a reported $8 million dollars. Does taking an object out of context and displaying it elsewhere make us see it differently? Are the curving lines and the smooth porcelain of the urinal beautiful? But what can we say about the shark? Is this art? What do you think? What I love about Duchamp and that functional object school is that attention is drawn to things we see and use every day never considering either how they were designed or by whom, how they were executed and made functional. That we are put in the position of making these considerations is, to me, where the art takes place. Our senses and sensibilities are awakened to a new awareness — including imagining the maker and the process. Is that not art? As to the Hirst piece: It seems to me that the conundrum of the title in juxtaposition with the dead suspended beautiful creature is where the art takes place. A shark’s life is one of motion. The unrealness of the still, momentous fish is shocking. The title is perplexing. We stand before it, either baffled or piss off, frightened or in awe. Ergo, Art. Thanks for the exercise. I echo Connie’s sentiments–I love this blog! What a great way to keep art present in daily life. 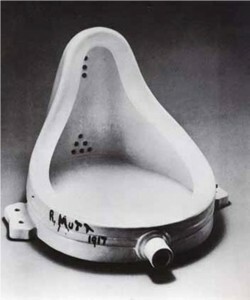 In the case of Duchamp, I think that artists had been using everyday objects as inspiration for centuries, but Duchamp took it to another level in that he used the urinal to awaken the imagination of each individual who viewed it, making the possible artistic interpretations endless and totally personalized to the viewer. In the case of Hirst, to me the shark is both awful and beautiful at the same time. Respect for life leaves me a little cold to have a dead creature embalmed in suspended animation, robbed of its dignity by the stares of people come to observe it, and yet, like a train wreck, I can hardly turn my eyes away from the fish, wanting to discover how it works, ask it questions about where it has been, what its life was like. In both cases, the artist has stimulated my imagination to interact with the object and come away with my own interpretation, rather than his, making us the artist. Quite wonderful. I think the urinal could be considered art, because some human had to design the urinal and create the design. I have never been fond of Damien Hirst and animals dead is not art to me, although my son loves his work and it fascinates him. It scares me. No! This is not Art as I see it! What did they do to make this art? Yes someone did design the urinal but not the person presenting it as art. As for the Shark….whatever! Art is defined by Webster as a skill, or any specific skill or its application, human creativity, any craft or creative work or its principles. Creative work as in painting, drawing, or sculpture; a branch of education and learning. These items took no work, no talent and for sure no craft! A calculating mind with the interest of making money, not inspiring or entertaining anyone must have presented these items to test just how gullible the public really is. Kirby you are an artist and your work is what I consider real ART. At best, they are “curiosities”. At worst, “the emperor has no clothes” art/science experiment. At least they slow down museum wall crawl! My opinion only, of course…. But I am sticking to it! I like to think of beautiful animals as art, but I don’t think one artist can take credit for that. After all, who made the animal? The act of displaying something beautiful in a way that helps us see it better and see new things to appreciate, is a service to the public. The same with the urinal – when you look at it in a different perspective, as provided by the artist, it can be a thing of beauty. But again, who actually designed and built it? Utilitarian objects also have designers, who are artists. What do they think about this? Thanks, Kirby, for stirring up the pot and getting us to think and interact. As a friend of mine always quips: Sometimes a cigar is just a cigar. Sometimes an embalmed shark is just that. It maybe art but if it is or not, is of no consequence to me. I simply don’t have a dog in this fight. More directly, I think it’s just silly. If “all the world is a stage” then perhaps “all the world is art”. The hand of the creator has fashioned incredible masterpieces all around us. Even though I’m a relative “newbie” in the art world, sometimes I feel as though the Artist goes more for the shock value of a piece…how outrageous can they be? What will truly evoke some kind of feeling from the viewer? If I look at what the pieces stir up inside of us (and isn’t that what art is supposed to do?) then I suppose I could call the urinal “art”. Who is the artist though, the person who actually designed the urinal or the person who recognizes it as a work of art? Rather than be the judge and jury, I’m going to just continue to make my art because it brings me so much joy and if others enjoy looking at it as well…then that’s just an extra bonus! Thank you for this wonderful blog and for giving us an opportunity to explore the possibilities. I am a collage artist and I love recycle/found object sculpture. So yes, I feel this is art. I easily walk by pretty but appreciate when I am emotionally and mentally stimulated. As an artist don’t we develope skills by trying to perfect What past artists did (we copy and reproduce) and some of us hope to take that skill and put it in a new context (create something new, or different). We want to leave a piece of ourselves in the art for immortality sake but the best is when we discover something about ourselves in the making and others discover something about themselves in the viewing. Thx! We’ll keep it comin’!